Helmut Nickel, Shark Year Magazine. The following provides an update and more information on the previous article Shark kills surfer off France’s Reunion island. 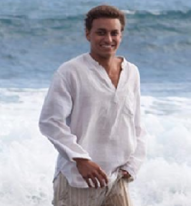 The information-site zinfos974 is reporting that the body of Alexander Rassiga ( 21 ) who succumbed to a fatal shark attack yesterday afternoon at Trois-Bassins located on the west coast of Reunion Island, will be laid out from 16:30 hrs today at a funeral in Saint-Pierre. Family and friends of the victim will gather to bid him farewell. According to the same source, the autopsy showed that the first shark bite (below the knee) was not fatal, but a second bite severed an artery. Despite lengthy resuscitation attempts, the life of the young surfer could not be saved. Immediately after the shark attack, Roland Ramakistin (the mayor of Trois-Bassins) has ordered a ban on swimming and water-sports all along the coast of his commune. The ‘Minister for Overseas France’ Victorin Lurel has promised “ a plan to protect and support the commune “. After a series of shark bite incidents (including two fatalities) in Reunion last year, the “Institute of Regional Development”( IRD ) was commissioned to conduct an extensive study to understand what caused the bite incidents. A total of 23 bull and tiger sharks have been tagged so far with acoustic tags to determine habitat use and their movement patterns. To learn more about this study, please see the related PDF-paper ‘Shark Risk Management in Reunion Island’ ( here ). But some local surfers are demanding more drastic measures. “We put murderers in jail, so let’s get rid of dangerous animals,”says Christophe Aubert, the brother of a surfer who was killed by a shark last year (see here) and a member of the local Association ‘Océan prévention Réunion (OPR)’. Guy Gazzo, a diver and member of the Regional Fisheries Committee, shares this opinion. According to him, there is a “clear overpopulation of sharks” on the west coast. “With each dive, sharks are seen in groups of two or three,” says Mr. Gazzo, advocating the removal of the sharks. Youtube-Video below (uploaded on 24. July 2012) : Surfer killed in shark attack off Reunion. Sources: zinfos974, linfo.re and AFP. Photo Credit: Laurent Capmas. In this location there is no meaning of killing sharks. If you kill the ones you see now, new ones will come in. It does not change anything in just a few months. This area is known for its sharks before the French even got there. Currents and conditions of shores and the geography makes it clear that these waters are shark infested waters for ever. You can see more sharks here more than anywhere in the Indian Ocean. Big sharks as well. Tigers and Bulls. They are high in numbers around all the islands. “some surfers are demanding more drastic measures”…….like what, detonate a hydrogen bomb like they did on Bikini Atoll and make the waters uninhabitable for marine life for decades to come? This latest incident is very sad indeed, but sharks have inhabited these waters for millions of years; they aren’t going anywhere. We had just visited Reunion a few weeks previous to this incident to experience diving there for ourselves. I personally did nine dives around the St Leu area and never once encountered any sharks and by all accounts, for divers in that particular area, sightings are rare. I have been to other places in the world where shark encounters for divers are more likely. We have to remember that we are just visitors to the sharks world and respect that they are just acting on instinct. We know there is a risk every time we enter the water. It is very sad that someone lost their life doing something they loved and our thoughts go to their family and friends at this sad time. The fact these waters are infested of sharks, does not justify to use innocent animals, as dogs to be used as horrific baint for them, which kind of people lives there? THE FACTS ABOUT DOG WHERE DONE 20 YEARS AGO BY FEW CRAZY FISHERMEN & IS FORBIDDEN !!! SINCE THAT, THERE IS SO MUCH CONTROL & REGULATION THAT THIS PRACTICE DISAPPEARED FROM THIS ISLAND 20 YEARS AGO; AN EXTREMIST NGO FROM REUNION TOOK THE OLD PICTURES & SPRAYED THEM ON THE NET, CHANGING THE DATES ON PICTURES TO MAKE PEOPLE BELIEVE THAT PEOPLE HER DO THAT NOWADAYS !!!! THIS IS DISINFORMATION & I CAN ENSURE YOU THAT PEOPLE HER ARE NOT THAT BARBARIANS !!! WE ATTACKED THIS PROBLEM MANY MANY YEARS AGO AS THE 99 PER CENT OF THE POPULATION HERE WAS SHOCKED AS I WAS TO SEE HOW FEW PEOPLE COULD BE SO BARBARIANS. BECAUSE OF DISINFORMATION YOU HAVE A PICTURE OF REUNION ISLAND FAR AWAY FROM REALITY; POLICE SERVICES HERE TRY TO FIND WHO EXACTLY ARE DOING THIS BY HACKING WEB SITES, STEALING COPYRIGHTS & PICTURE; ALMOST IMPOSSIBLE TO FIND, BUT THEY RISK THE JAIL !!!! !